To learn about any program details, please visit our Facebook Page. Events will have their own Event pages when the season’s event is near. Contact the Borough Office at 412-242-4824 or email office@edgewoodboro.com with any questions about the following events! 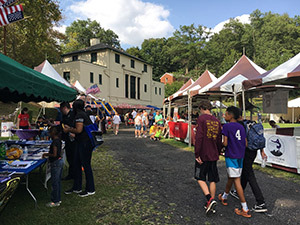 Community Day is a great family time in Edgewood Borough and fun for people of all ages. From the Volunteer Fireman’s chicken and ribs dinner to the Police Raffle, everyone has a grand time. Visit our Facebook Page for a tentative schedule of events and announcements. Each spring, near to the Easter holiday, children ages 2 to 10 are welcome to bring their own basket to Koenig Field at noon to collect as many eggs as they can carry! Be sure to arrive on time, as the eggs go fast! Watch our Facebook Page for dates each year. 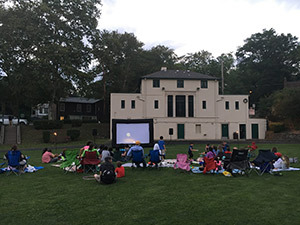 Four Movie nights are held each summer in June and July. Beginning in 2019: Movie Nights are now THURSDAYS! Movies begin at Sunset (around 9pm) at Koenig Field, but come early for trivia and games! A food truck will be on-site, so come hungry! Watch our Facebook Page for movie titles, which are typically announced in spring. Come to the Koenig Field House for crafts, cider and hayrides through Edgewood! This annual tradition is a nice warming treat to get ready for Halloween. Thanks to the Edgewood Volunteer Fire Department and the Edgewood Foundation for making this free event so special. 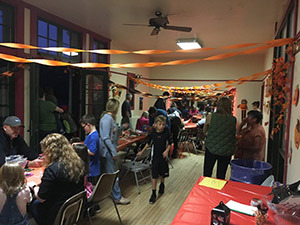 Fall Festival is held in the month of October, leading up to Halloween. Details can be found on our Facebook Page. The first Friday of December is the evening that Santa always visits Edgewood! He will meet us at Memorial Park and light the Borough tree with his magic. After the Borough tree is lit, we will gather at the Edgewood Club for warm drinks, cookies, a traditional Christmas movie and a chance to visit with Santa himself! Please bring a new, unwrapped toy for the "Toys for Tots" toy drive. Otherwise, admission is free. This event is sponsored by The Edgewood Foundation. Youth Sports are year round in Edgewood, with Baseball in the early spring, Tball and Softball in the summer, Soccer in the fall and Basketball in the winter months! Adult fitness programs Yoga and Tai Chi are also available in the summertime. Visit our Sports Page for more details. Visit the Edgewood Foundation’s website for a long list of wonderful community events they spearhead. From the Wine and Chocolate Affair in the fall, to Stream Sweeps throughout the spring and summer, there’s something for everyone. Visit the CC Mellor Library Calendar for events for all ages! Whether you like to crochet or have a toddler looking to have fun making messes, there are events happening all week long, every season of the year. Visit the Edgewood Historical Society’s Facebook Page for info on their next open discussion, held at the Edgewood Club. Discussions are typically held one Wednesday each month, except during their summer break.